Premier Mounts drives the 103in Panasonic plasma up the wall | What Hi-Fi? And not only does it hold the Panasonic TV, it can even tilt it by up to four degrees, should you really want to put the screen over the fireplace and angle it down for more comfortable viewing. 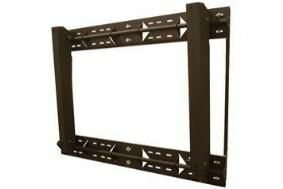 Now available, the TWM-102 has multiple anchor points to allow it to be attached to walls with different stud patterns, slotted mounting holes and lateral shift to allow the screen to be centred. It can even be modified for side-by-side or stacked use, should you wish to run four or more of the monster Panasonics in a video wall!